2017 has been the year of yoga retreating for me. Granted, I only went on two yoga retreats, but given that I’d never been on a yoga retreat until this year, I’m calling it the year of yoga retreats. My trip to Tulum in March was absolutely incredible and completely reignited my yoga practice so when I was offered to chance to attend The Retreat at Veritas this fall, I immediately said yes. 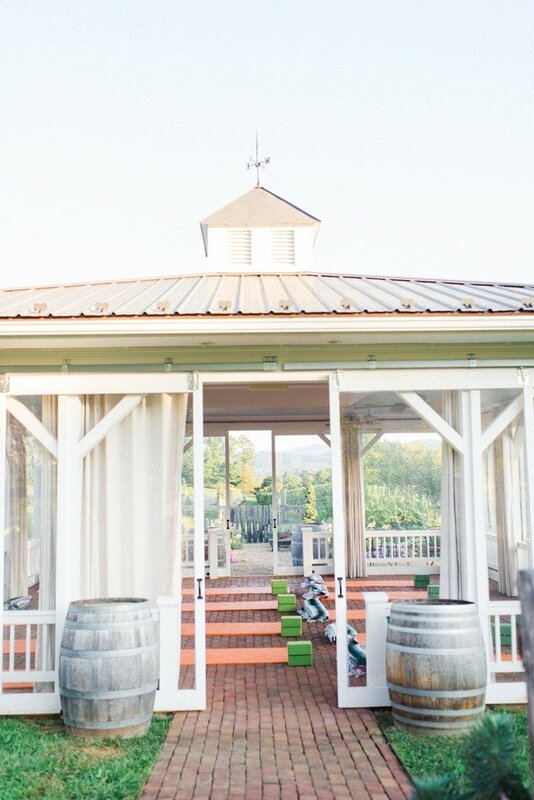 To give you a little background, Veritas is a family owned and operated vineyard and winery located in Afton, Virginia. The winery sits at the base of the Blue Ridge Mountains (about 20 minutes from Charlottesville) and it’s actually one of my favorite local wineries. Isaac and I went for the first time to celebrate our 7 year (dating) anniversary and I’ve loved it ever since. 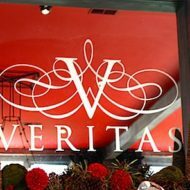 When we were planning our wedding I totally had dreams of using Veritas as the venue. 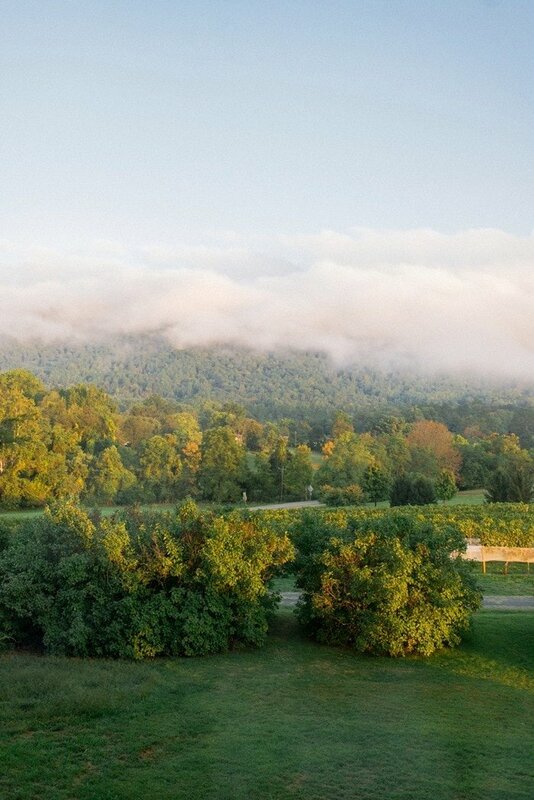 Their wine is some of the best coming out of Virginia and the location is stunning. Needless to say, I’m a big fan. 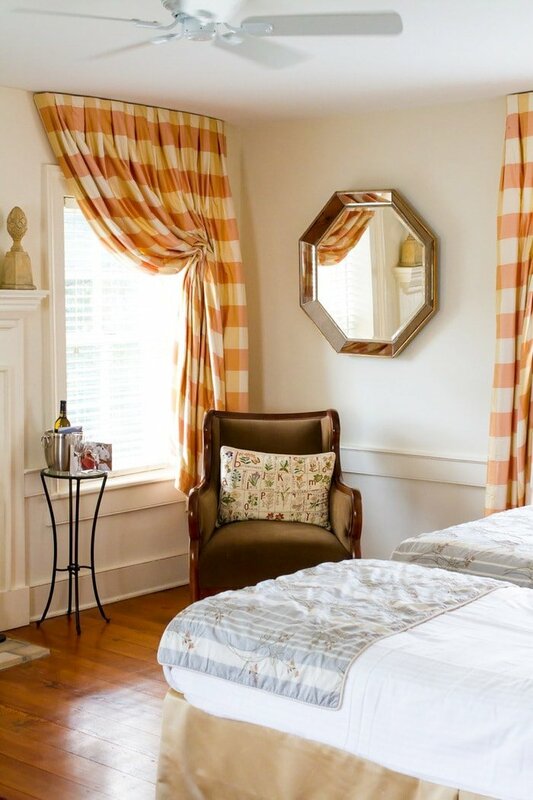 Along with the winery, the family also runs a farmhouse bed and breakfast on the property with eight guest rooms and suites. I had previously looked at renting the Barn Cottage for an anniversary trip so I was well aware of the adorable accommodations but I had no idea they offered yoga retreats. Turns out they do… and they’re quite lovely. One of the coolest things about the Veritas yoga retreats, besides the fact that they integrate yoga and hiking, is that they offer two options — one day mini retreats and extended three night, four day retreats. I’ve never heard of one day yoga retreats before, but I’m in love with the concept. It’s perfect for someone who wants the yoga retreat experience, but may not be able to get the time off work. And it makes it incredibly affordable! I was invited to attend the September extended retreat with a friend. It was tough to find someone who was able to come given the Sunday – Wednesday dates, but luckily my friend Michelle is a photographer and has a flexible schedule so she was able to swing it. We had an absolute blast hanging out during the retreat and I’m so thankful she came because it wouldn’t have been nearly as much fun without a friend, not to mention she is an amazing photographer and took most of the photos I’m using in this post. Since we attended the extended retreat, that’s what I’ll be sharing about. 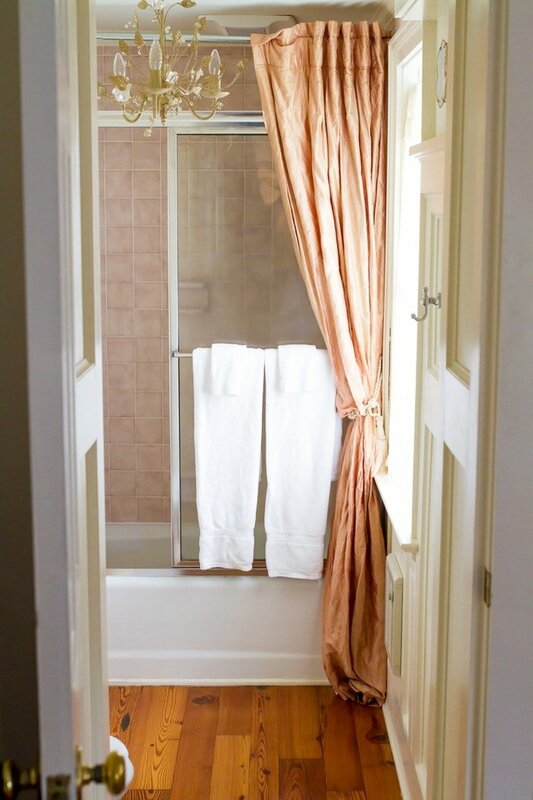 First off, here’s a peek at the room we stayed in. As for the the retreat experience, there were two yoga classes per day along with daily activities to choose from including but not limited to hiking, getting a massage and/or attending a cooking class. And lots wine… of course!! 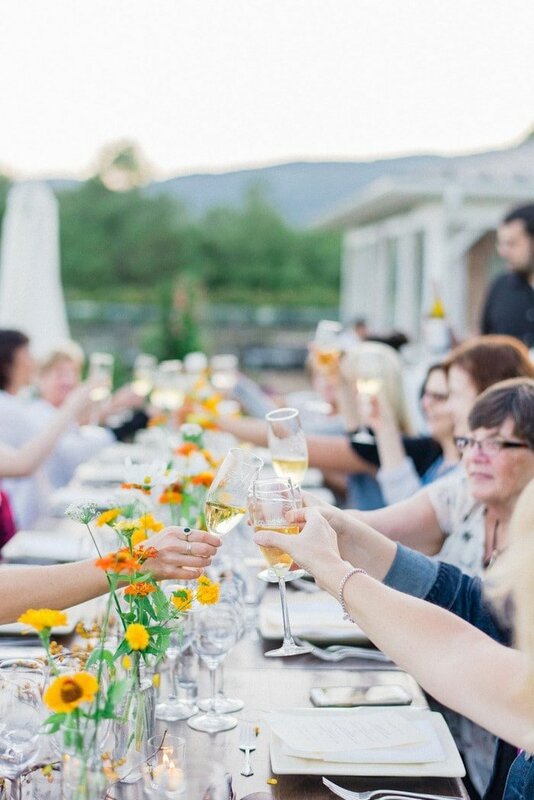 You have the opportunity to do tastings, along with vineyard and cellar tours and each evening there’s a lovely wine hour in the farmhouse before dinner. 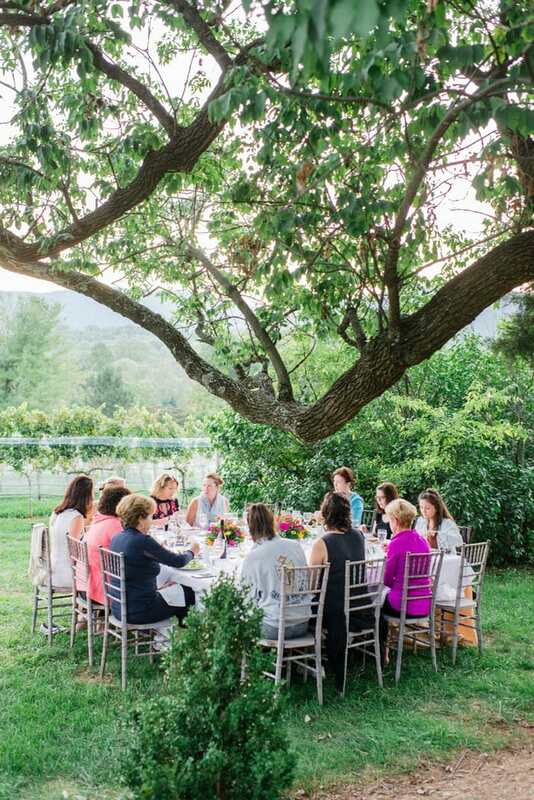 If you like yoga, hiking and wine this retreat is such a dream. Given my love for all three I was in heaven. 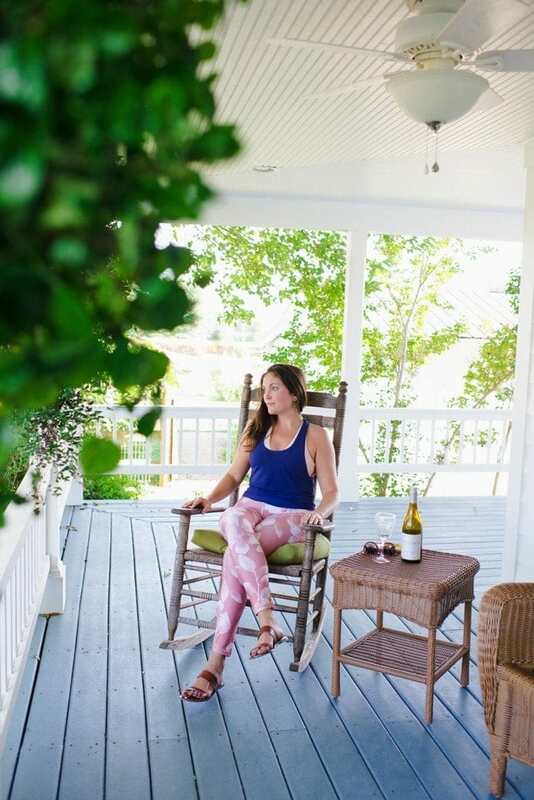 Wake up, put on yoga clothes and grab a cup of tea or coffee before a sunrise yoga session at the Garden House with the retreat yoga instructor, Lynsie McKeown. 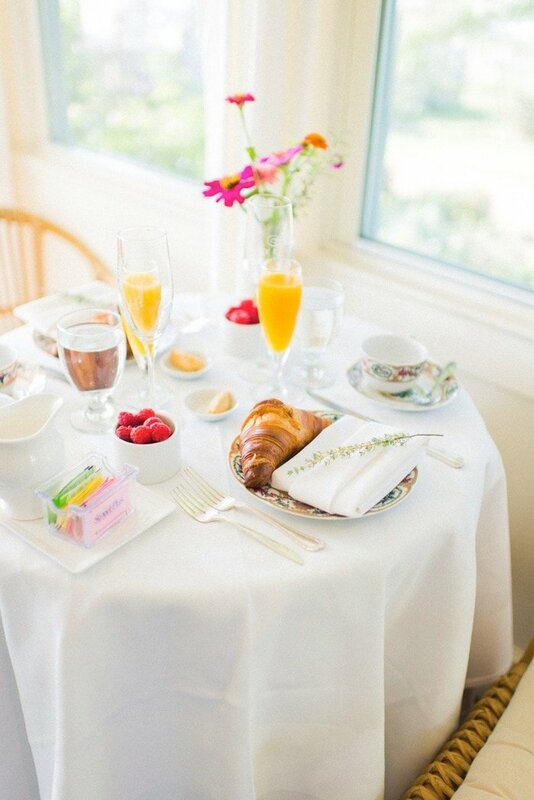 Post yoga a delicious farmhouse breakfast is served by the house chef each morning — equipped with fresh croissants, coffee, juice and a hearty meal to fuel the planned activities. Given that you’re staying at a winery/vineyard it’s only appropriate that you’re offered sparkling white wine with breakfast. I feel like a lot of the ladies in our group skipped on the breakfast wine, but Michelle and I gladly toasted each morning. 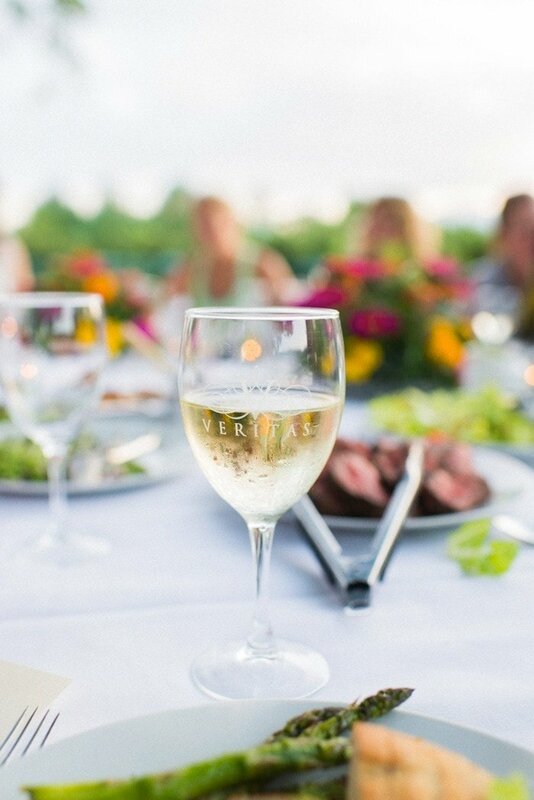 When you’re on vacay and offered a crisp glass of sparkling wine… you enjoy that wine regardless of what meal it is! Next up we got ready for the daily hike. 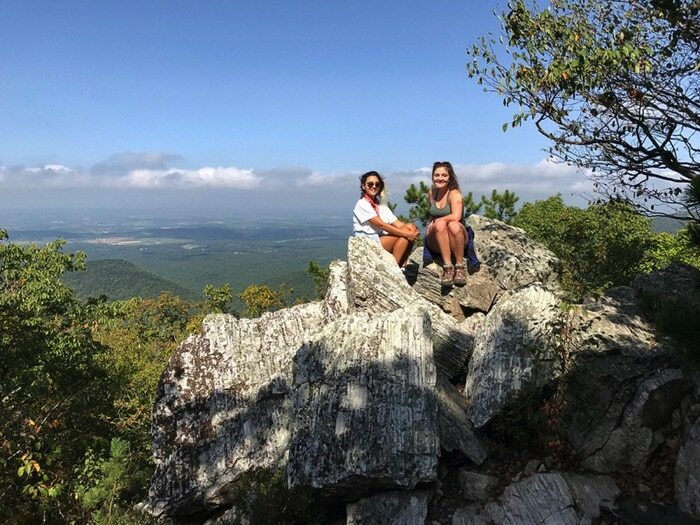 The first day we opted to do a long hike (about 9 miles) along the Appalachian Trail and the next day we did a hike to Chimney Rock in Shenandoah National Park. The second hike was only about 3 miles, but perfect after a long day of hiking the previous day. The hikes were led by two guides (Lynsie and Melanie). These ladies knew the trails so well and had tons of neat tidbits about the native trees and plants to share. There were options offered for all skill levels so you could hike anywhere from 1-10 miles and you certainly don’t have to hike if you aren’t feeling up for it. The only thing mandatory on this retreat is that you fully enjoy yourself and do what makes you happy. 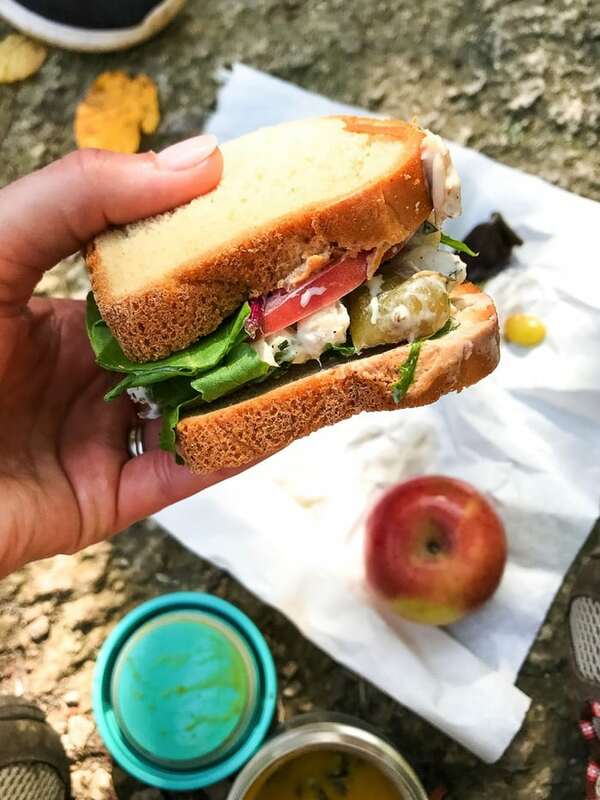 About halfway through the hike we stopped to enjoy the view and have our packed lunch, which was made by the farmhouse chef. It was always some sort of delicious soup, a flavorful sandwich/wrap and a treat, like homemade granola. I have to note that the Veritas team graciously accommodated dietary preferences. I had gluten-free meals and I know there were a couple vegetarian that were accommodated as well. After hiking we’d head back to the farmhouse to shower, grab a snack and get ready for the afternoon activities. 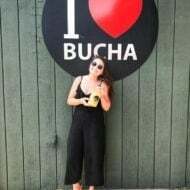 As I mentioned above there were plenty of activities to choose from including wine tasting, a cellar tour, a cooking demonstration and horseback riding. Around 5:00PM we headed back to the Garden House for a relaxing evening session of yoga nidra, which is basically the best yoga practice ever because you get to sleep. I’m kidding… sort of! It’s really it’s a guided mediation and you’re not actually supposed to fall asleep…but I totally did on the first day. I’m going to blame it on the 9-mile hike, but the second day I managed to stay awake the whole time and absolutely LOVED the mediation. After getting nice and zen during the evening yoga practice there was a brief amount of time to prepare for the wine hour and dinner. 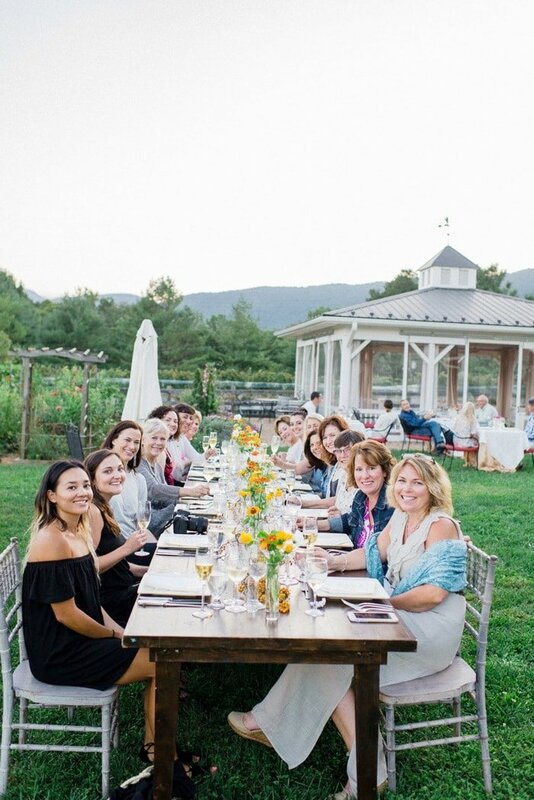 The weather was gorgeous for the September retreat so we had all of our meals al fresco with the sun setting behind the vineyard. It was dreamy. After dinner everyone usually hung around the table for a bit… enjoying a glass of wine (or two). 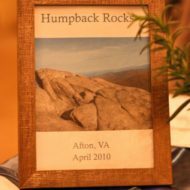 Although you were welcome to head up to your bedroom to retire whenever you like, it made the evening that much more special to connect with the others in the group. 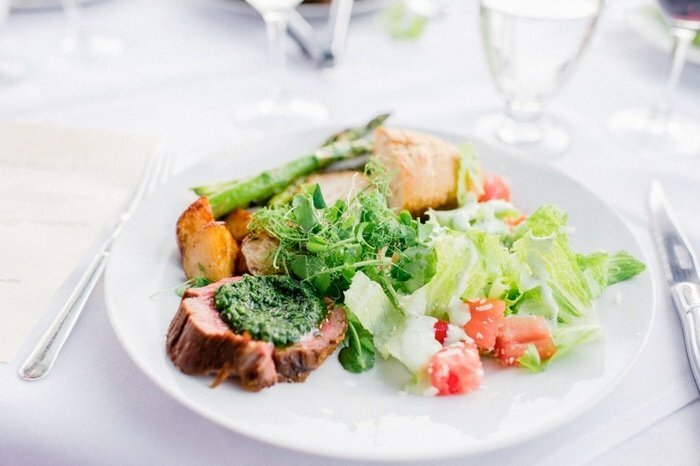 If you can’t tell from all my talk about the meals (and the photos)… they were a true highlight. 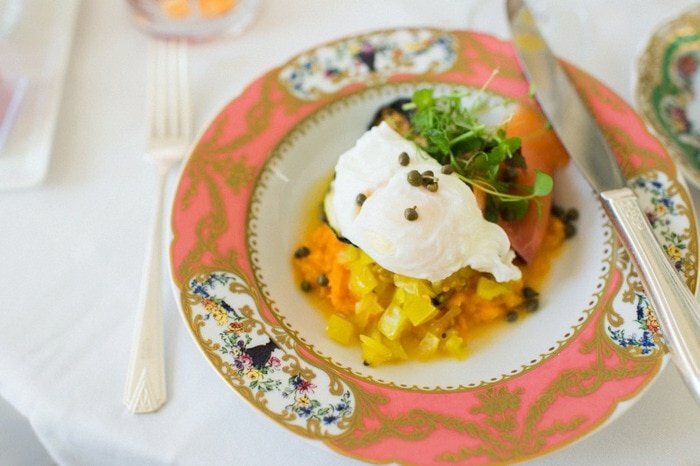 Breakfast and dinner consisted of several courses paired with wine, and the food was simply delicious. 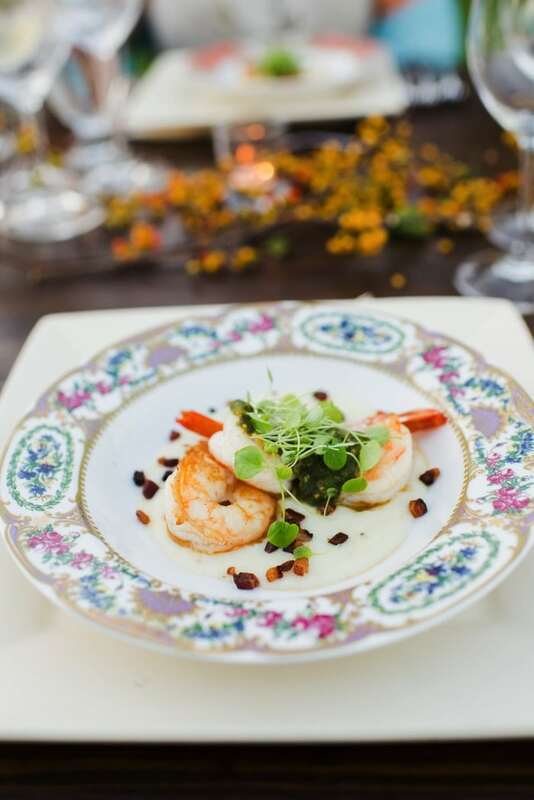 The farmhouse chef, Andy Shipman, knows his craft well and puts a great deal of effort into using real-food ingredients to create incredible dishes. Although the farmhouse retreats are open to both males and females, our group was all women and I absolutely loved the dynamic. I feel like the conversations were more open and honest than they would have been if guys were around. Michelle and I were two of the youngest ladies, but I liked it because we met and connected with some amazing women of all ages. It was so great chatting with them about their lives and realizing we have a ton in common despite our difference in age. As a I mentioned, Veritas is a family owned and operated winery and the family bond was so evident during the retreat. 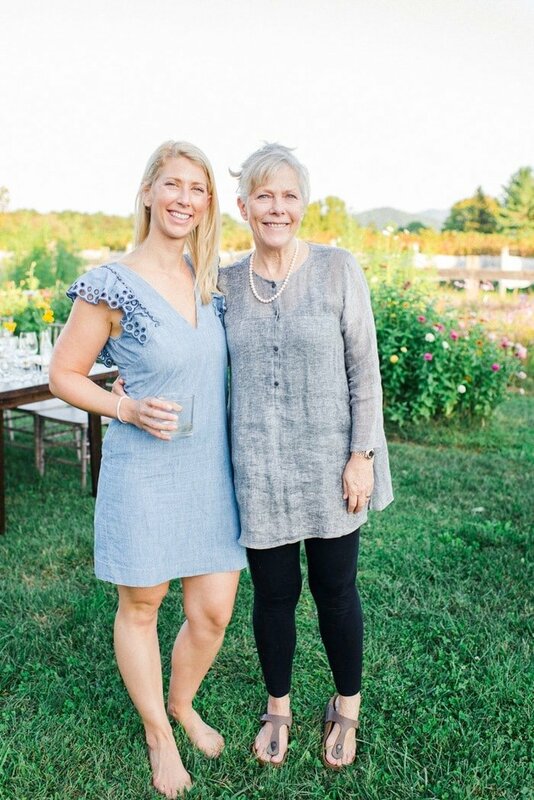 Patricia and Andrew Hodson are the owners and founders of Veritas Vineyard & Winery and a lot of their family members are part of the team Patrica and her daughter, Chloe, take part in the retreat activities and eat dinner with the group. Patricia and Andrew’s other two children, Emily and George, along with Chloe’s husband, Elliott, all work at the vineyard & winery as well. Emily as the head wine maker, George as the general manager and Elliott as the assistant wine maker. 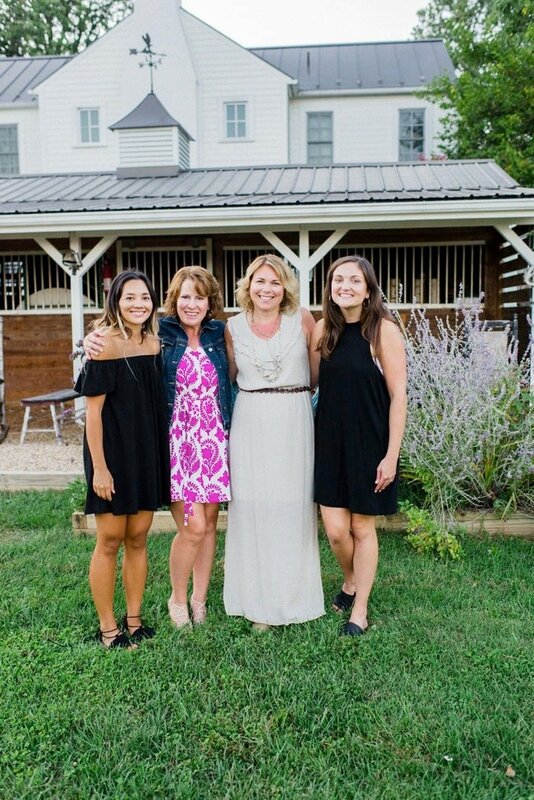 The farmhouse manager, Diane, is also part of the family and does a wonderful job making sure everything is perfect for guests at the farmhouse. Throughout the retreat you find yourself getting to know everyone, their history and the family dynamic that runs deep. I learned so much about the vineyard and wine making just by chatting with them during our long hikes or while enjoying a meal. It’s truly a unique experience. After attending two yoga retreats this year I’ve decided that they are one of my favorite ways to vacation. The combo of yoga with relaxation, self-reflection and connecting with other like-minded people is unlike anything I’ve ever experienced. Yoga retreats attract a beautiful variety of individuals, and it’s a great opportunity to get to know people you would normally never be exposed too. If you’ve been on the fence about treating yourself to a yoga retreat, I say do it because I know for a fact that you won’t regret it. 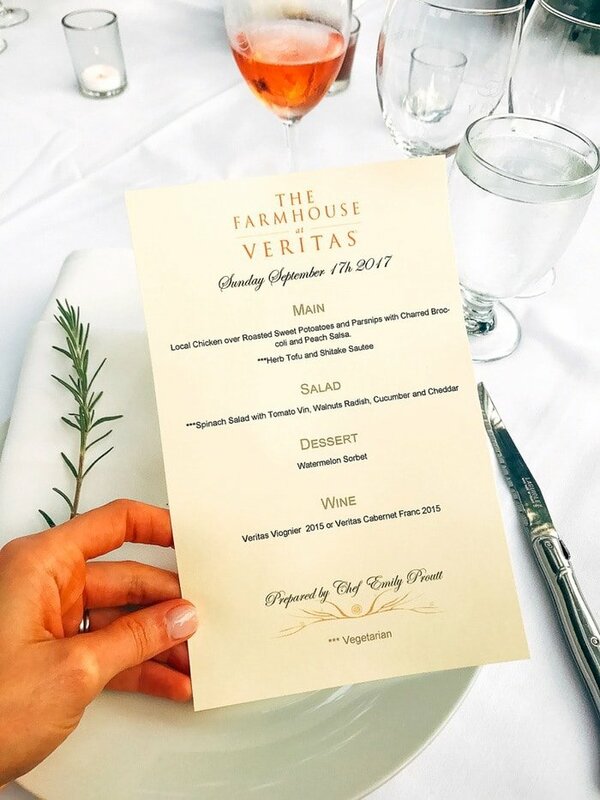 And if you’re looking for a lovely spot that has it all — amazing food and wine, yoga and hiking, you have to look into the The Retreat at Veritas. Or if you’re not up for a retreat simply plan a trip to the winery for a tasting. They host many events so it’s likely you’ll be able to find a day that works with your schedule. If you do visit the winery, be sure to try the Scintilla, a sparkling white, the Viognier, Petit Verdot and the Cabernet Franc — all my favs! Special thanks to Veritas Vineyard & Winery for hosting me for the September retreat and to Michelle Chu Photography for her lovely photography skills. 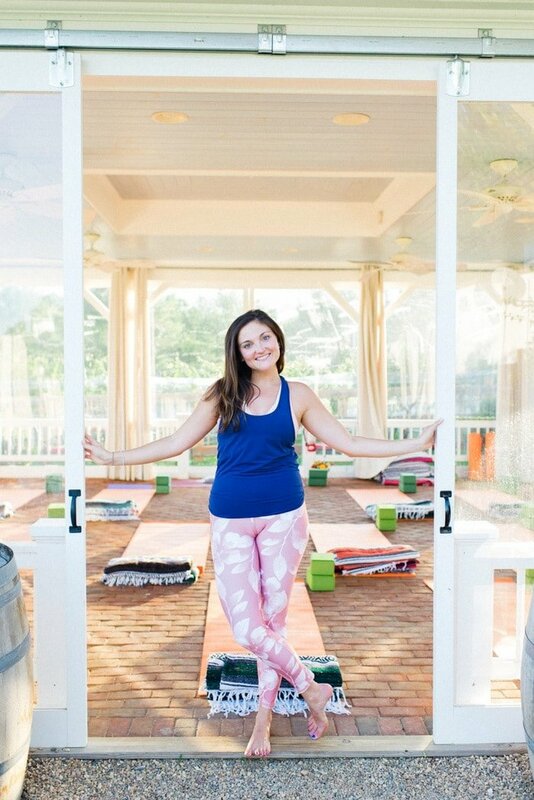 I’m new to yoga, but this retreat looks AMAZING! I would love to do something like this. Such a beautiful event! A very memorable experience sharing my birthday with such caring and loving women! Loved chatting and meeting women from all over but discovering common threads!! Highly recommend Veritas winery. The staff and family are lovely!! 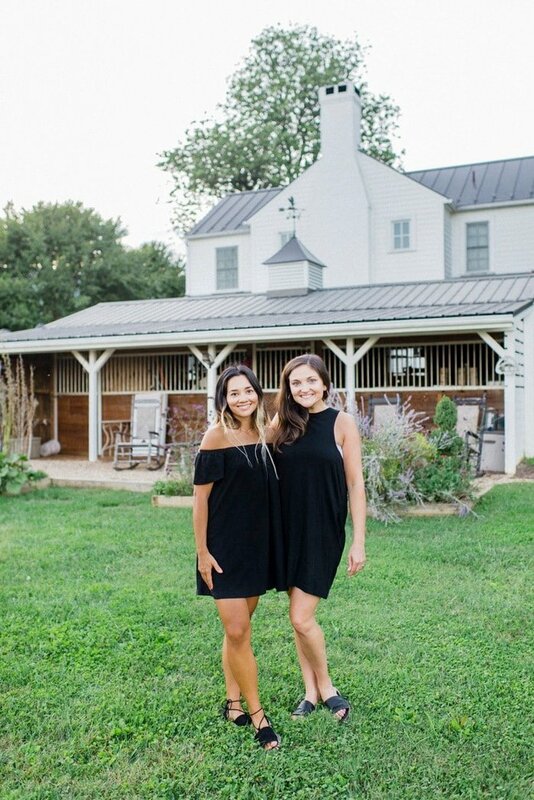 I’ve been meaning to tell you that me and my bestie are going to Veritas yoga retreat May 20-23 2018 because of YOU! I followed you while you were there on Instagram in September 2017 and became obsessed with going! haha. So the first week of January 2018 we booked our trip! Now it’s just over 2 weeks away! We are flying into Richmond (we live in Fort Lauderdale, FL) and staying 2 nights in an Airbnb and then driving to Afton! Sooooo damn excited!! Thanks for sharing this! I can not wait!